You might have learned the hard way why doctors always say that you should never pop your zits or pick at your face. If you conquered acne, but are left with the scars and marks you are not alone. Most people who suffered from moderate to severe acne in their youth are now dealing with these terrible after-effects. Acne can remain a problem long after the blemish has disappeared because it can leave post-acne marks and scars. AcneFree Scar Fade & Erase is an intensive lotion that claims it will reduce post-acne marks. Does it contain the ingredients necessary to give you results? Scar creams are always held to a higher standard than your typical acne cream because scars are much harder to get rid of, especially if you have had them for years. We will take a closer look at the ingredients before we make our final determination about AcneFree Scar Fade & Erase. AcneFree Scar Fade & Erase was developed by University Medical Pharmaceuticals, a company specializing in skin care products for nearly 20 years. 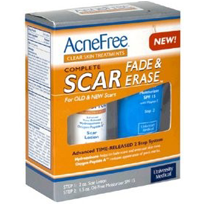 Coming from a great brand, AcneFree Scar Fade & Erase could be a good way to eliminate skin discoloration caused by acne. AcneFree Scar Fade & Erase re-balances skin tone while the lotion lightens post-acne marks and eliminates red or dark discoloration of the skin. The fundamental ingredient in the AcneFree Scar Fade & Erase formula is 2% Hydroquinone. Hydroquinone is a skin lightening ingredient used to help you achieve a clearer complexion. Expect the results with AcneFree Scar Fade & Erase to be a gradual process and fade within 8-16 weeks of using the treatment. Is AcneFree Scar Fade & Erase Safe? The power behind this product is actually dangerous. Studies concerning Hydroquinone have exposed the ingredient as a health hazard. Hydroquinone has been known to cause internal health issues as well as exogenous ochronosis. Exogenous ochronosis is a disease that creates blue-black pigments on your skin, a much worst situation than acne scarring. 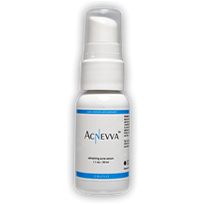 Overall, we would recommend looking elsewhere to find that top acne treatment for acne scars. Even though you can purchase AcneFree Scar Fade & Erase at stores like Walgreens, it doesn’t mean this treatment is a safe and smart choice. The risks of using Hydroquinone are not worth the potential results. The FDA is still evaluating the ingredient and its potency. 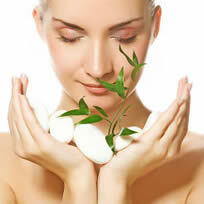 It would be in your skin’s best interest to consider alternative acne treatments. I bought this product a while back and have yet to get a full use out of it. I just think it’s silly that it states at least twice on the bottle- do NOT use with benzoyl peroxide products, yet it’s an acnefree product. Hello, what do you think my skincare routine is? AcneFree… and what is the main ingredient in their skin line? Benzoyl Peroxide. Why would they make a product with their name on it that cannot be used with their main ingredient? It feels like a waste of money. And after reading these potential dangers I really don’t think I’ll ever get around to trying it. Scars are hyperpigmentation of the skin. Go to a spa in your area with good rewevis, ask for their website, and also seach them on the web, you can find rewevis there. They most likely would have facials and spot treatment, recommeneded from the Esthetician for you. Dermalogica works for me for daily care, and they have spot treatment medicine also. Good luck! OH MY GOSH!!!! With the risk of contracting internal injuries as a side effect of this product completely amazes me! 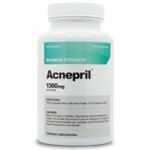 We acne sufferers have ENOUGH to worry about besides dying from internal injuries from our ACNE MEDICATION!!!! I’ll NOT be trying this one!! !